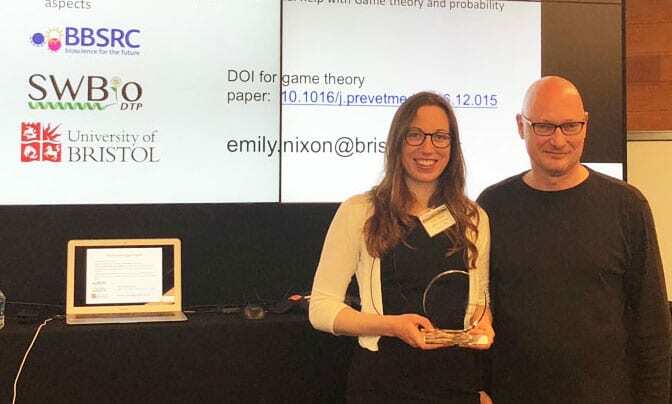 On the 15th and 16th May, Emily Nixon visited IBM Research in Almaden, California as an invited speaker at the Distinguished Speaker Forum, a bi-weekly series which is live-streamed globally across IBM. The aim of the forum is to bring together IBM and external researchers in order to discuss how analytics can be applied to gain insights from data. I gave a one-hour lecture on how data and modelling has been collected and used by her research group in order to understand more about the transmission and control of a severe parasitic disease in sheep (sheep scab). My talk was followed by 30 minutes of Q&A and then 1:1 meetings with other researchers. I received good feedback for the talk and made some useful contacts. In environments where poor land quality precludes crop production, livestock represent the primary contribution to agricultural production and food security. Domestic sheep in particular are hardy and well-adapted to marginal land and harsh climates. However, sheep suffer from a wide range of parasites and disease problems, one of the most persistent and damaging of which in the UK is psoroptic mange, known as scab. Scab is caused by infestation by a parasitic mite, Psoroptes ovis. The mites cause a debilitating and destructive clinical disease; there are believed to be over 7,000 outbreaks of scab in UK flocks each year costing the UK sheep industry over £8 million per year from mortality, reduced weight gain and the costs of treatment. Despite a number of recent scab education campaigns, there is no evidence that scab prevalence has been reduced. Research at the University of Bristol has highlighted the risk factors associated with scab outbreaks, quantified the prevalence of the disease and suggested that regional or local scab management programmes may be a more effective use of time and resource than any attempted national eradication programme. However, at present there is considerable confusion about the best approaches to scab management, both in terms of the compounds to apply, when to apply them in relation to seasonal husbandry practices and in terms of farm/region scale effects. The aim of the project, is to develop a systems model which incorporates different farm types and husbandry approaches, incorporating farmer behaviour, to identify optimum management approaches to scab control under specific husbandry regimes.